My mission to get all my beauty/bathroom products organized in a more functional way continued this week! Last week was all about the bathroom counter and tub surround. 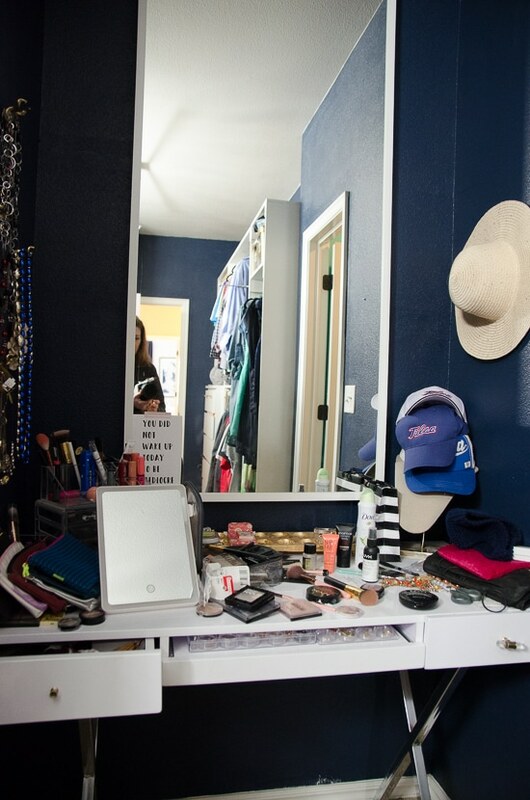 Today I tackled the biggest mess – the makeup vanity in the closet. Let’s go back a moment before we go forward. 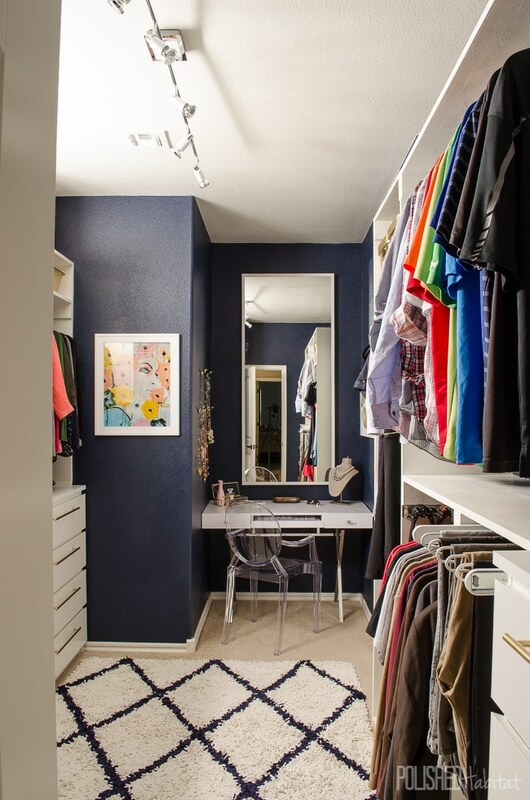 However, it’s been about 2 1/2 year since we finished the master closet makeover and a make-up organizing update was long overdue because things deteriorated to this. I’ve been subscribed to the $10 monthly Ipsy cosmetic mailings for over a year and I love all the products I get to try out, but in the chaos of the vanity, I receive products and almost immediately forget about some of them. I knew if I wanted to keep receiving them (and I do! ), I needed to have a way to organize everything in a way that was easy to access. And I needed to stop wasting time every single day just digging through the vanity for the basic items I need to feel comfortable leaving the house. How the most used products always ended up on the bottom, of the mess, I’ll never understand! Along the way, I had added a small cosmetic organizer to the corner. Not only was it too small for me, the drawers required a small battle to open and barely held anything anyways. To get this project going, I started with the first step I always recommend for organizing…remove everything! Ah, back to a blank slate! 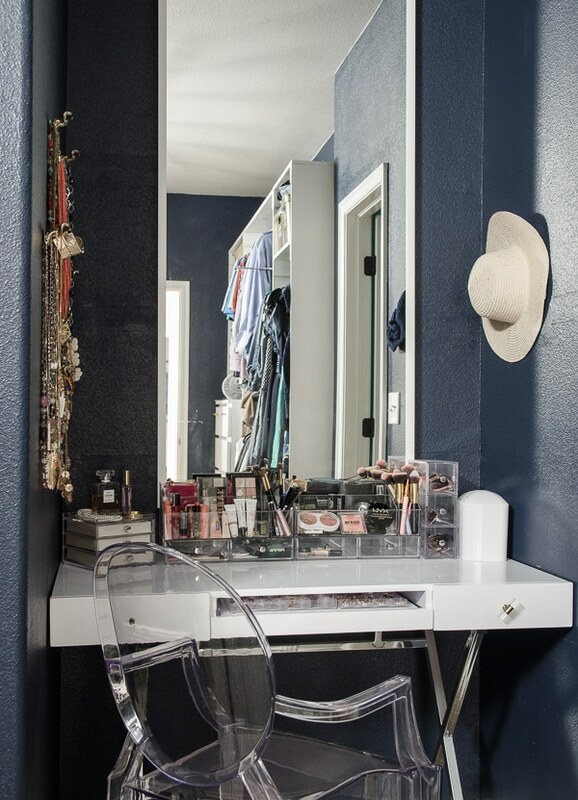 I measured the width of the vanity and was excited to realize I could fit two new large makeup organizers in the middle of the vanity with room to spare on each side. It’s SO nice to have ample room for lots of brushes and an easy spot to store mascara and eyeliner. I was worried the Interdesign version might have the same sticky drawers as my older organizer since it’s also clear, but the drawers work perfectly and can hold more than I expected! The makeup wasn’t the only problem in this area though, I also needed a solution for the jewelry I have from Gram. I was using a gold leaf DIY organizer I made during a thrift shop challenge, but gold jewelry on gold leaf isn’t so easy to see. Plus, it was taking up a ton of space while not feeling very protected. I found a 3 drawer jewelry organizer and it may be my favorite new-to-me product. It feels so fancy, but is hugely functional with different size dividers on each level. There was some great attention to detail with this design because the top even has a nice lip so it can serve as a tray. 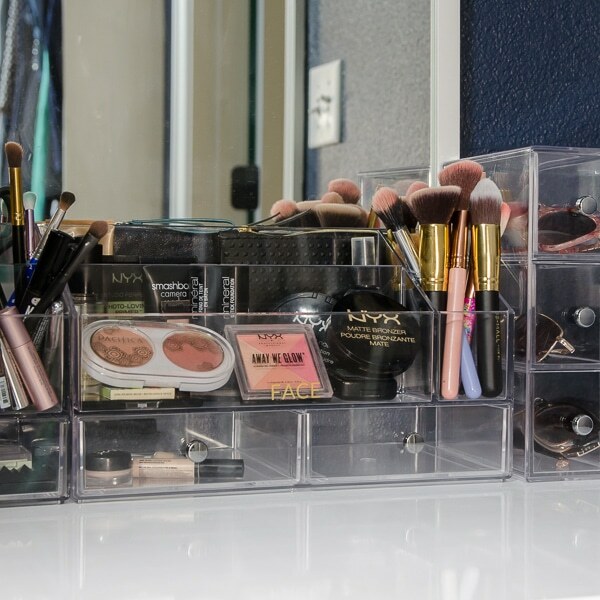 On the right side of the makeup, I used my other new favorite – the drawer flip organizer. 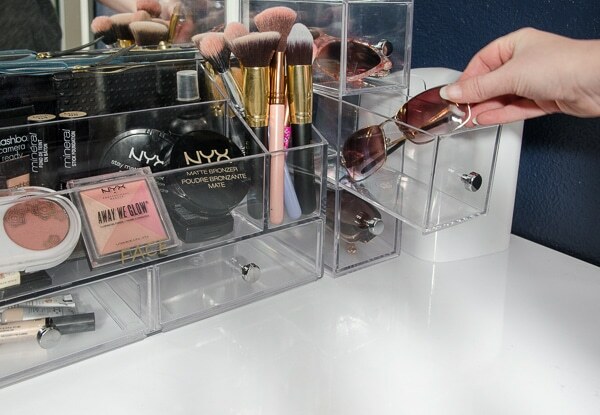 The drawers can be rotated so you can use the whole organizer vertically like mine, or horizontally. Brilliant! PS: Did you notice I still have an entire empty drawer in the makeup organizer? They hold SO MUCH! I was left with just enough room to slide in a countertop trash can on the far right end, which holds way more than I expected despite the size. 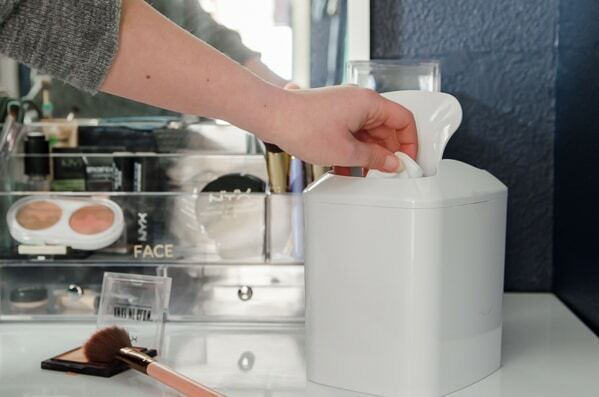 It’s so handy for makeup packaging, tissues, clothing tags from the closet, etc. 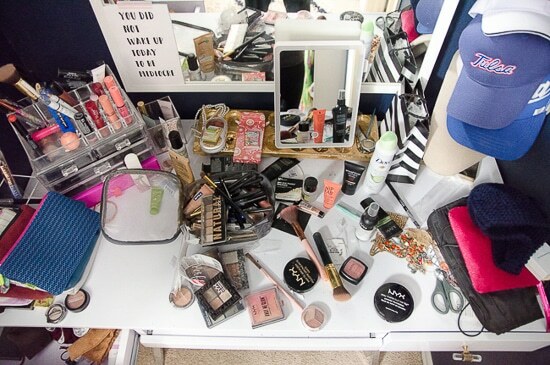 I’m embarrassed to say that all those things could be commonly found just left on the vanity before. So far, my plan to get organized in order to make a morning routine easier is working. I’m enjoying getting myself together in the morning and it puts me in a more productive mindset! 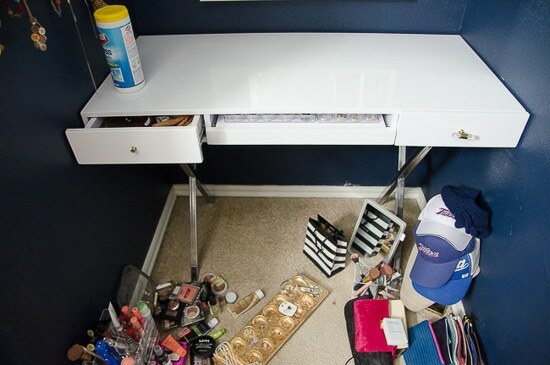 If you ignore the fact that we desperately need to replace the broken drawer pulls, the vanity is now the stuff my organizing dreams are made of. I hadn’t realized how much having the messy spot to get ready was pushing me toward minimal makeup and ponytail days. Which is totally okay on occasion for me, but doesn’t make me feel my best when they happen over and over. In case you need to solve any of the same issues I did, here’s the list of products I used from left to right. As always, while I recommend the products I used because they were perfect for me, it’s not about pressuring you to go with the exact solutions. But it IS about taking charge of the areas making YOUR life more difficult and finding a way to improve them. If the bathroom products are a struggle for you too, here’s a few more posts you need to check out next. So much better! 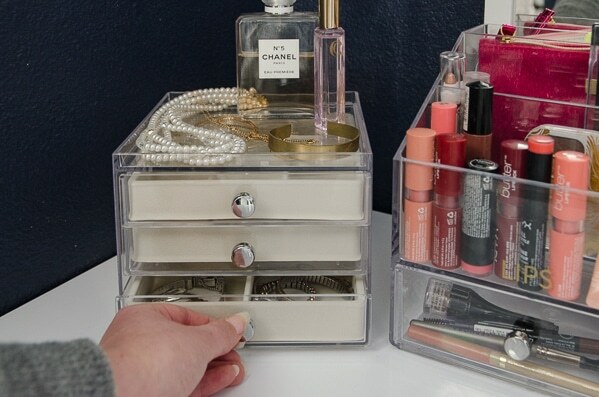 I love Interdesign stuff – there are lots of companies doing acrylic storage but their’s feel nice and sturdy. I do worry though when I see so many make-up items in one person’s collection – things do have an expiration period and surely no-one could actually use up that amount of product within that window? (honestly not being judgemental, just an observation). 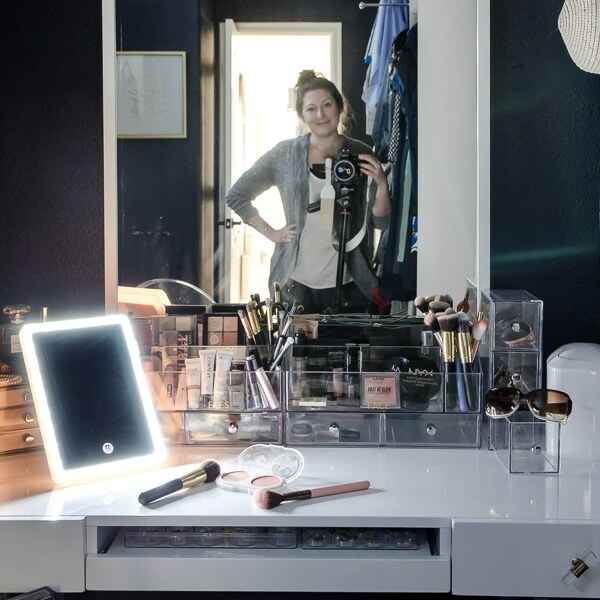 What vanity mirror is that? Do you like it? It looks like it lights up so we’ll, I need a mirror like that. Where do you store the mirror when it is not in use? I see it when you are putting on make up, but not in other photos. 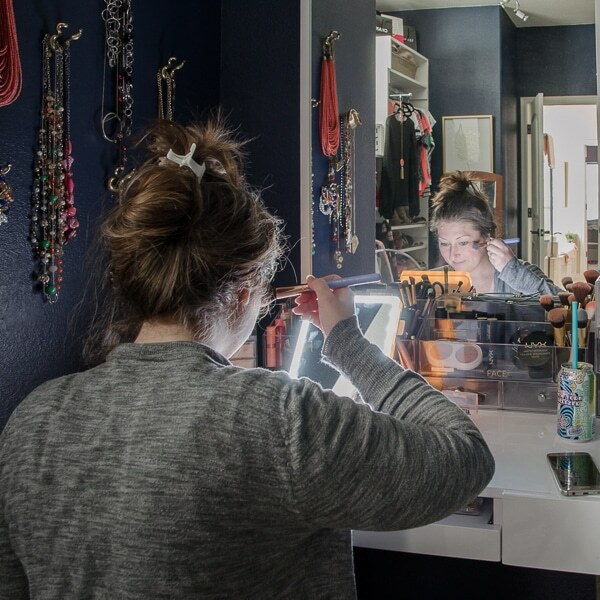 I have a large mirror on my vanity and it makes the area so cluttered looking. I’m going to check out your mirror. By the way, I love your blog. I may not comment but much, but I’m a faithful reader. Thank you so much Lolly! 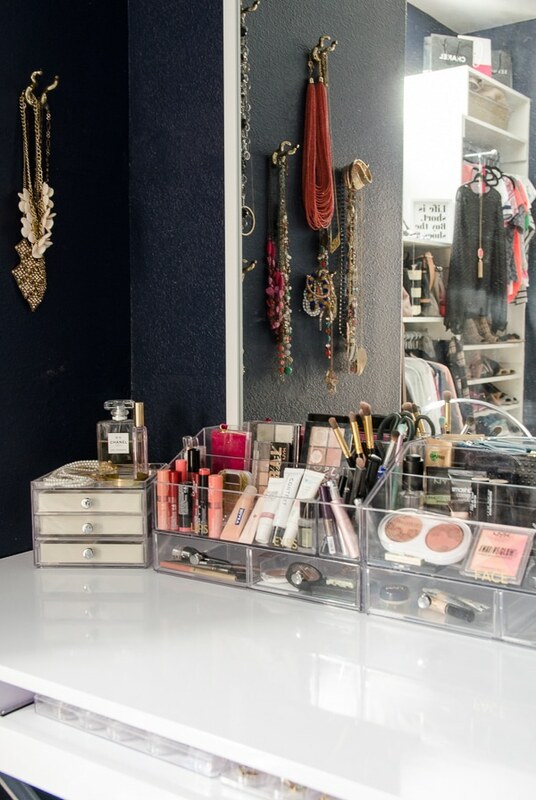 The kickstand of the mirror folds flat and I can stash it right behind the jewelry organizer against the wall. Super handy! I see, very cool. Thanks. This article gave me HOPE! 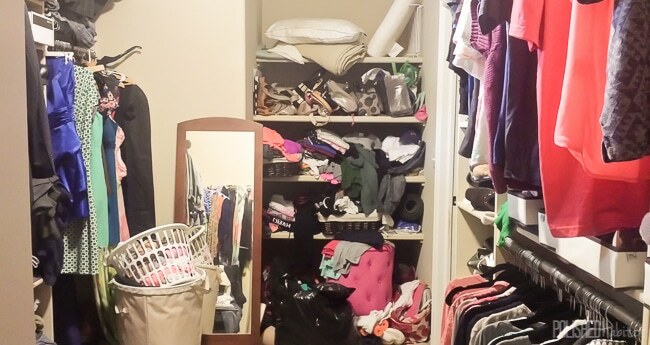 I am a messy person with serious wardrobe and vanity issues, unable to find anything on time. This surely looks like a challenge but the before and after pictures are a sight that I’d like to witness in my own vanity room. Must give a legit try. Yay! I’m glad you’re feeling hope. I’m genuinely a very naturally messy person. The only thing that REALLY helps me long term is making sure I’ve designated a place for each thing. 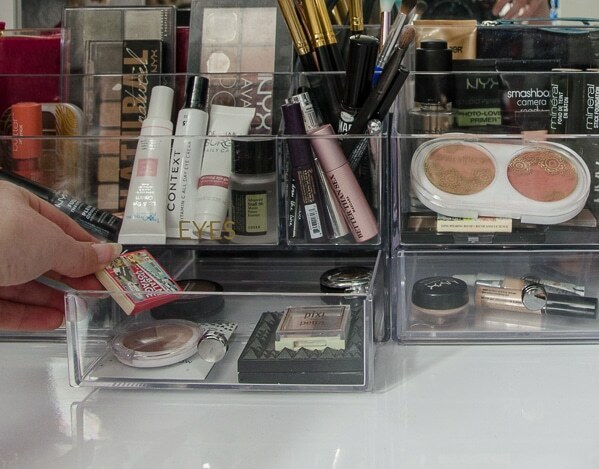 Now that I’ve been using those makeup organizers for awhile I’ve realized that having the large open sections on top has encouraged me to put everything back because it doesn’t take any longer to put things back as I use them than it does to set the product on the vanity. Total game changer for me!